Conventional pizza is loaded with carbs and gluten from the bready base – delicious but not so great for your waistline or energy levels. This super quick alternative using gram (chickpea) flour is unbelievably simple, yet still delicious and packed full of fresh flavours. 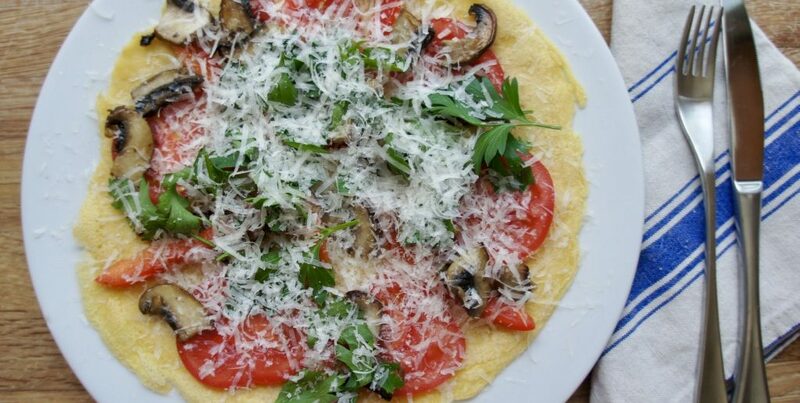 Gram flour is much richer in nutrients and fibre than regular flour, plus it’s totally gluten free, which will help to reduce pizza-induced bloating, keep your gut happy and help you feel fuller for longer. You just need to get the batter made a little in advance, but when you’re ready to cook, the rest can be done in minutes. Get the batter made up a few hours before you want to cook the pizzas, overnight also works well. If you’re in a rush, try and leave the batter to sit for at least half an hour if you can. To make the batter, place the flour in a large bowl (stir to break up any lumps) and gradually add the water, whisking well all the time until a smooth batter forms. Add the salt and pepper, and leave the batter to rest for at least half an hour, ideally four hours or even overnight. When you’re ready to cook the bases, heat a tsp of oil (such as coconut or ghee) into a non-stick frying pan, large enough to make an adult-sized base. Pour half of the batter into the hot pan, swirling the mixture around to evenly cover the base of the pan. Cook like a traditional pancake for 1-2 minutes, then turn using a spatula and continue to cook on the other side until crisp and golden-brown on both sides. If it doesn’t come away easily when turning, just give it a little more time to cook before trying again. Remove the cooked flatbread onto a plate, and repeat the process with the remaining flatbread batter. Decorate the flatbread base with your choice of topping ingredients from the list above, and serve!